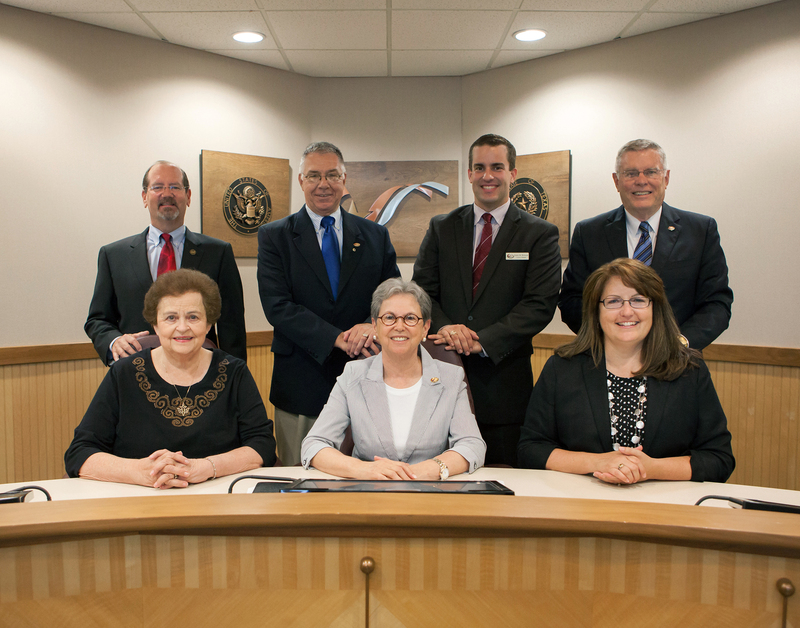 Y ou’re reading a live blog from the College Station City Council’s workshop and regular meetings on Thursday, July 9. It’s not the official minutes. Updates will be posted as the meeting progresses. The workshop has started. Councilmember Julie Schultz is absent tonight. The council reviewed the proposed 2015-19 Consolidated Plan, FY16 Action Plan and the Community Development budget. Required by the U. S. Department of Housing and Urban Development, the 2010-14 Consolidated Plan expires Sept. 20. The plan includes a community needs assessment, housing market analysis, housing conditions analysis, and specific goals and objectives to establish a unified vision for actions that will be carried out for the next five years. The city is also required to submit to a one-year Annual Action Plan describing projects, activities, and budget funded with the federal community development grants. Grant funds available next year include $1.54 million in Community Development Block Grants and $787,047 in HOME Investment Partnership Program Grants. These funds must be used to benefit low- and moderate-income people, aid in the elimination of slum and blighting influences, or meet an urgent community need. CDBG funds also may be used to meet local needs through a range of community development activities while HOME funds must be used for affordable housing activities. Historically, the city has used these funds for affordable housing assistance programs, funding for direct services to low-income families, demolition, and park, street, and public facility improvements in low-income areas. Economic development is a new project included in this plan. The final drafts of the plans and budget will be presented to the council for adoption on July 23. The council learned more about the Citizen Advisory Committee’s recommendations for facilities projects — police department, a future Fire Station-7 and a community center — to include in a possible November bond election. The public may email additional comments to 2015bond@cstx.gov. For more information about the possible bond election, go to cstx.gov/2015bond. Additionally, the council heard from a Cris Ruebush, a representative of PGAL, the facility consulting firm that recently evaluated multiple City of College Station facilities, including the existing College Station Police Department. The council received a presentation about different ways to fund transportation projects the city needs to keep up with its growth. Mayor Nancy Berry suspended the workshop meeting, with remaining items to be discussed at the conclusion of the regular meeting. Mayor Berry adjourned the meeting for a five-minute break. The regular meeting has begun. 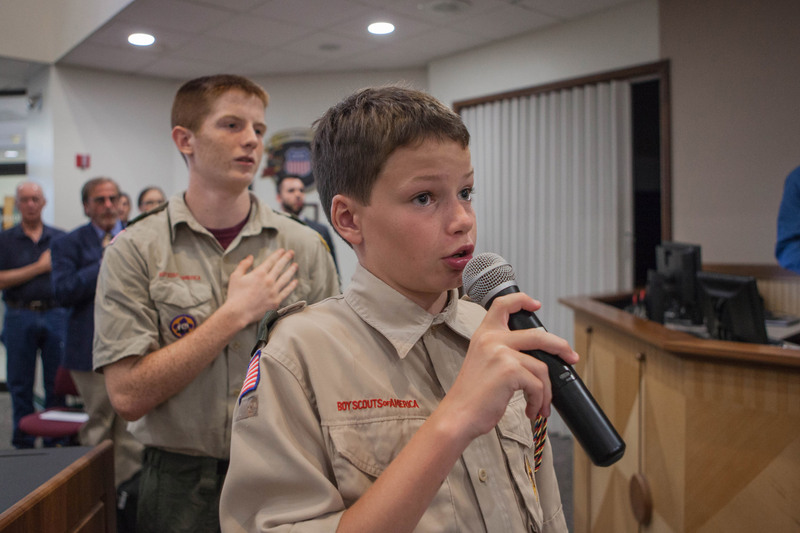 The Pledge of Allegiance was led this evening by First-Class Boy Scout Daniel Wilson (foreground) of Troop 1861, and by Life Scout Chase Gibson (background) of Troop 1222. 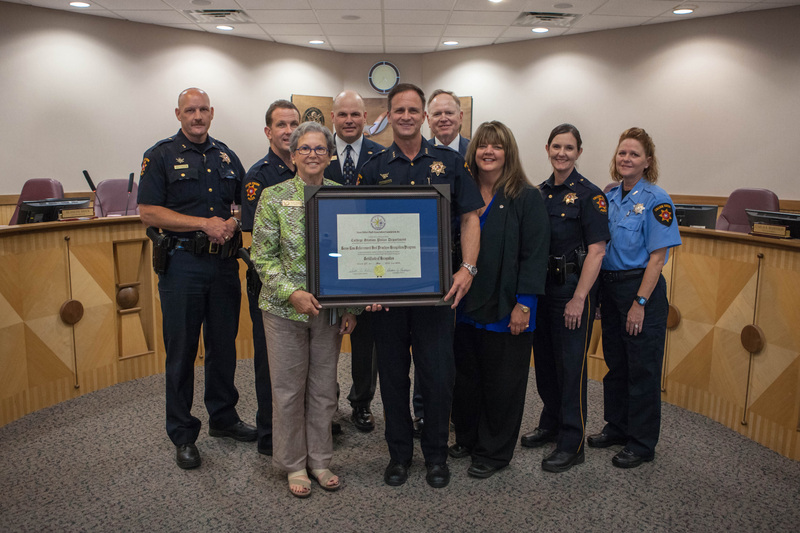 The council recognized the College Station Police Department for achieving compliance with the Texas Police Chiefs Association’s best practices program. Pictured with Mayor Nancy Berry are Assistant Chief Billy Couch, Assistant Chief Chuck Fleeger, Assistant City Manager Jeff Capps, Police Chief Scott McCollum, Chief James McLaughlin, Jr (Ret.) of the Texas Police Chiefs Association, Accreditation Manager Zeta Fail, Assistant Chief Brandy Norris and Holding Facility Supervisor Shannon Combs-Ballard. Two people spoke during Hear Visitors, when citizens may address the council on any item that doesn’t appear on the posted agenda. Ben Roper recognized Army Specialist Richard Arriaga as part of the Fallen Heroes Memorial program. The 20-year-old Ganado, Tex. native died during an ambush by small-arms fire and rocket-propelled grenades on Sept. 18, 2003, in Tikrit, Iraq. Rejection of a bid for the Southwood Valley Substation Transformer Rewind. A 1.15 million contract with WEG Electric for the purchase and installation of two substation transformers. Rejection of a bid for the Animal Deterrent Project for the Post Oak Substation. An annual price agreement not to exceed $806,500 with Brazos Paving for the purchase of cement stabilized base rock and Type D grade recycled crushed concrete base. Implemented an all-way stop control intersection at the intersection of Francis Drive and Walton Drive. Implemented a yield sign for the free right-turn bay going from southeast bound Walton Drive onto southwest bound Francis Drive. Prohibited left turns for southbound Francis Drive at the College Hills Elementary School driveway during morning drop-off and afternoon pick-up times. The $170,950 purchase of changeable message signs from American Signal Company through the Houston-Galveston Area Council cooperative contract. A $96,000 contract with Kimley-Horn and Associates for professional engineering services related to traffic signal and other improvements at the intersection of Fitch Parkway and Victoria Avenue. The third renewal of a semi-annual competitive purchase agreement not to exceed $960,000 with Knife River for Type D hot mix asphalt for the maintenance of streets. Renewal of a purchase agreement amount not to exceed $526,000 for Type II, FGSMA hot mix asphalt. An annual price agreement not-to-exceed $60,022.40 with ProSTAR Industries for janitorial supply purchases. A bid award of $283,639.04 for the annual purchase of single phase pad-mounted transformers for inventory. The second renewal of a$66,530.46 award to Greenville Transformer Company for annual transformer repair and rebuild services. The council voted unanimously (6-0) for a performance-based economic development agreement for 232 acres on the south side of Rock Prairie Road near the future Bird Pond Road intersection. A step in the implementation of the Medical District Master Plan, the agreement is expected to facilitate private development in the area. The subject property is located in the relatively undeveloped eastern portion of the Medical District, where the master plan identified the need for regional infrastructure. Most of the infrastructure outlined in the agreement would be required for the development of the area even if the Medical District did not exist. The plan provides for a mix of residential and commercial land uses, including a possible urban town center. The agreement provides a funding mechanism to reimburse the property owner for the construction of the primary infrastructure. Property taxes generated by the additional value created by the property owner are deposited into a separate fund. Once the property owner meets the performance obligations, he may use the additional revenue to reimburse himself for the infrastructure. To access the additional revenue, the property owner must create an additional $50 million in taxable value and add at least 150,000 square feet of non-residential improvements. The more value the property owner creates, the more tax value is available to reimburse for primary infrastructure. The current taxable value of the subject property is about $251,270. The council voted unanimously (6-0) to create Rock Prairie Management District No. 2 located in the southeast quadrant of State Highway 6 and Rock Prairie Road. The Medical District Master Plan outlines several implementation strategies, including the creation of a municipal management district. The land in Rock Prairie Management District No. 2 is predominantly owned by College Station Town Center and is intended for the construction and financing of water, wastewater, stormwater, detention, drainage, roadways and recreational facilities. A board of directors appointed by the council later tonight will manage the district. The council voted 5-1 (James Benham voted nay) to appoint five citizens — Jeff Brown, Hays Glover, Kamal Ariss, Uri Geva, and Randall Rother — to the Rock Prairie Management District No. 2 board of directors. Council passed a motion that would ensure College Station residents would always maintain the board’s majority, with the city council retaining ultimate authority over that board. Councilman Benham argued that the board’s makeup should only consist of College Station residents. Some of the appointed citizens do not live in Bryan. After a public hearing, the council voted 5-1 (James Benham voted nay) to deny a request to change the Comprehensive Plan Future Land Use and Character Map from Restricted Suburban to General Suburban for about 22 acres located at 3940 and 4300 North Graham Rd. This property is located west of Holleman Drive South near the Sherwood Heights Subdivision and immediately north of the city limits. Had the change been adopted, it would have set the stage for rezoning to allow a residential subdivision with high-density single-family housing. That item is scheduled next on tonight’s agenda. After a public hearing, the council voted 5-1 (James Benham voted nay) to deny a requested change to the zoning district boundaries from Rural to General Suburban for about 22 acres located at 3940 & 4300 North Graham Rd. After a public hearing, the council voted unanimously (6-0) to change the Comprehensive Plan’s Future Land Use & Character Map from Estate and Restricted Suburban to Restricted Suburban and Suburban Commercial for about 25 acres at 4201 Rock Prairie Road. The property is located at the northeast corner of Rock Prairie Road and Bird Pond Road. The applicant requested the change as a step toward permitting a residential subdivision on about 17 acres with an additional 5-7 acres for Suburban Commercial development. The rezoning of the property is the next item on tonight’s agenda. After a public hearing, the council voted 5-1 (Steve Aldrich voted nay) to postpone this item until the Aug. 13 meeting. The proposal would change the zoning district boundaries from Rural to 17 acres of Restricted Suburban and about four acres of Suburban Commercial for a 26-acre tract generally located at 4201 Rock Prairie Road. The council has taken a five-minute break. After a public hearing, the council voted unanimously (6-0) to remove parking along Arrington Road after citizens became concerned about parking along Arrington between State Highway 6 and Decatur Drive. A primary concern was vehicles needing to drive in the opposing left-turn lane or on the other side of the double yellow lines due to available pavement width. After an evaluation by traffic engineers and a recommendation by the Traffic Management Team, city staff presented a no-parking ordinance to the property owners, residents and business owners along Arrington Road at a public meeting on June 2. All those attending the meeting supported the ordinance. After a public hearing, the council voted 5-1 (Karl Mooney voted nay) to remove stopping, standing and parking along Ravenstone Loop, Appleby Place and Edinburgh Place. Residents were concerned about being able to see Forest Ridge Elementary School students crossing the street at the trailheads and Ravenstone’s intersection with Appleby and Edinburgh. An additional concern was the ability of emergency vehicles to respond to emergencies in the area during school pick-up and drop-off periods. Based on observations by the fire department, police department and traffic engineering, the city presented the ordinance to residents at a public meeting on June 4. About half those in attendance were in favor of the ordinance and half were not in favor. The regular meeting has concluded. The council now returns to the unfinished workshop meeting agenda. The council gave direction to staff to pursue one of the proposed designs for markers (slide-5 in the PowerPoint presentation) at the city’s major gateways. The mayor adjourned the meeting. The council meets again July 23. This entry was posted on July 9, 2015 by City of College Station. It was filed under City Council, Public Communications .